People are tired of watching YouTube videos that aren’t the correct size. 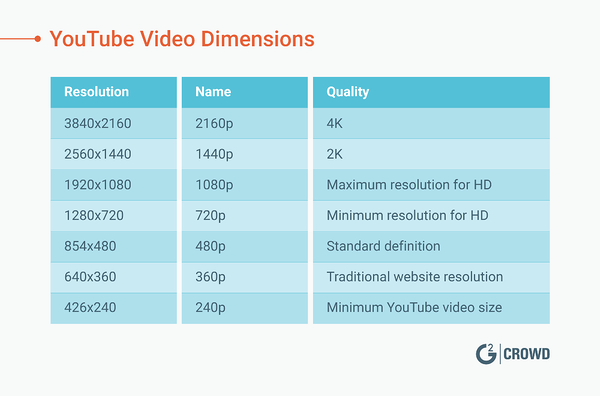 That’s not the only reason you want the correct YouTube video dimensions. 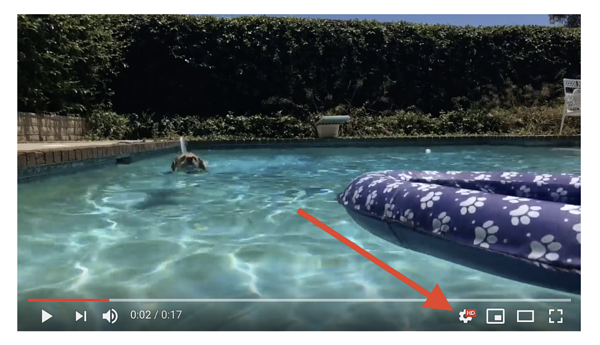 By having the correct YouTube video resolution, you’ll maximize the opportunities for search optimization (aka getting more views) when you decide to make a YouTube channel. If you want the best quality and no video cropping, be sure to make your YouTube video with one of the following seven dimensions. This is the highest HD resolution you can use. 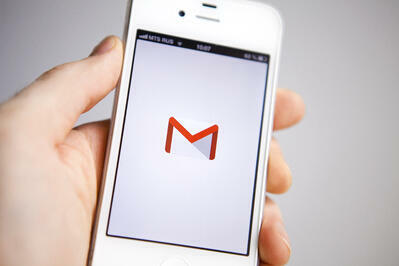 However, depending on your situation and use of YouTube, you may prefer a different size. Why do I recommend 1080p? Well, I used to work at a post-production company. And although I was in the marketing department, “1080p” was the phrase I heard used the most. When my post-production friends (who worked on everything from McDonald’s commercials to major productions like Fury Road) editing my acting reel, they couldn’t believe it wasn’t in 1080p, and wanted to change the resolution for me. In short, 1080p will give you that professional look, without using as much of your phone’s data when uploading videos. 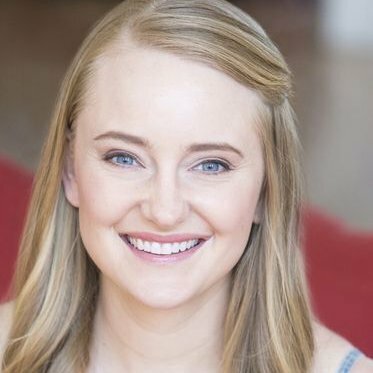 Because let’s face it: Data is precious to everyone! No one wants to run out. In addition, if you’re filming on your phone, you’ll run out of space before you know it using 2K or 4K. If you’re still experimenting with your YouTube channel, and you want to maximize storage space on your device, 720p will still give your viewers that High Definition experience they crave, even when watching on large devices such as LCD displays. Aside from your aspect ratio (proportions) and dimensions, there are additional YouTube video guidelines to keep in mind. The difference becomes much easier to visualize with this visual. For example, look at how many 480p, or standard definition videos, fit within the 1080p high definition dimensions. Don’t worry, YouTube videos are not automatically screened in 4K; if you spend 30 minutes watching YouTube while commuting you won’t burn through all of your data! If you want to watch in a higher or lower resolution, you can do so with just three simple clicks. And, just like that, you can view in a higher resolution for an enhanced viewing experience, or, alternatively, as low as 144p to save your data while on the go. Have more lingering questions about the lingo discussed above? You’ll find the answers here! Does my phone automatically record in the correct YouTube video size? If you have a newer phone it will record in the correct dimensions. For example, the Samsung Galaxy Note 8 can film in a resolution up to 2160p; the highest recommended size for YouTube videos. 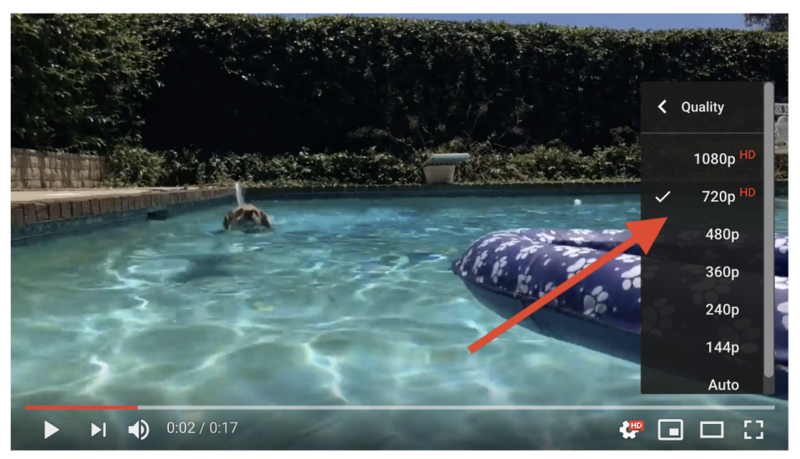 In order to save room on your phone, if you’re recording a high number of YouTube videos from your phone (like I may or may not do when at the dog park…), it’s a good idea to record in a lower size. What is the size of a video frame? The size of a video frame will vary based on the video player. 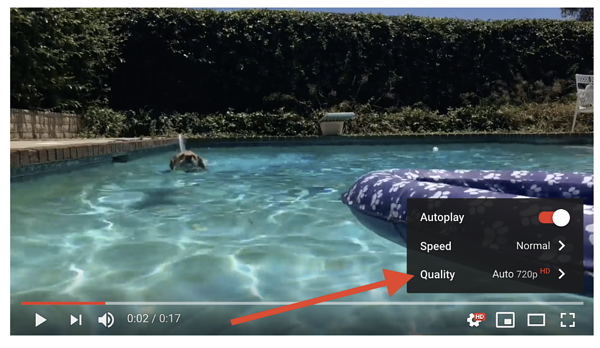 In this case, when looking at the YouTube video player, use a minimum of 720p, or 1280 x 720 pixels, for High Definition. How many MB is a YouTube video? 5 minutes of a 720p video will use approximately 75MB of data. 5 minutes of a 1080p video will use approximately 170MB or more data. What is the aspect ratio for YouTube videos? What does video aspect ratio mean? 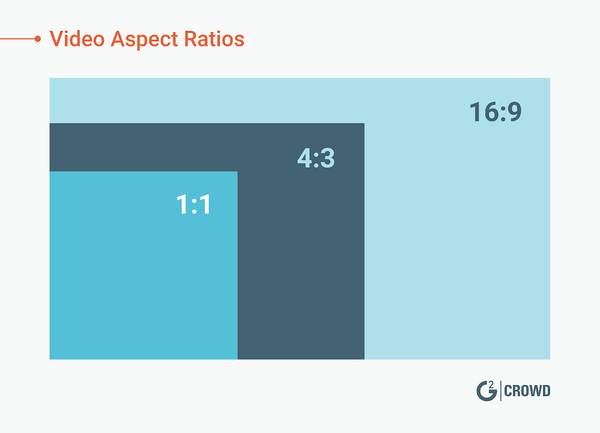 Here’s a quick breakdown of what those aspect ratios mean and where you will find them. 1:1 aspect ratio: This is what you’ll see in Instagram videos; 1:1 is a perfect square. 4:3 aspect ratio: Love watching old-school sitcoms from the ’90s? That’s 4:30; think of the TV in your parent's basement. 16:9 aspect ratio: This is the new standard for watching videos. 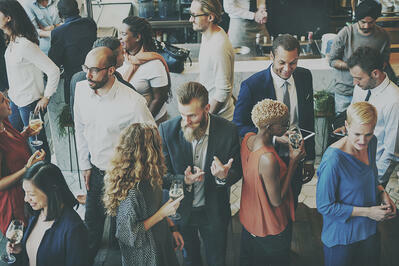 Whether it’s YouTube, your big screen TV or event the movie theatre, professional video content is now made in 16:9. 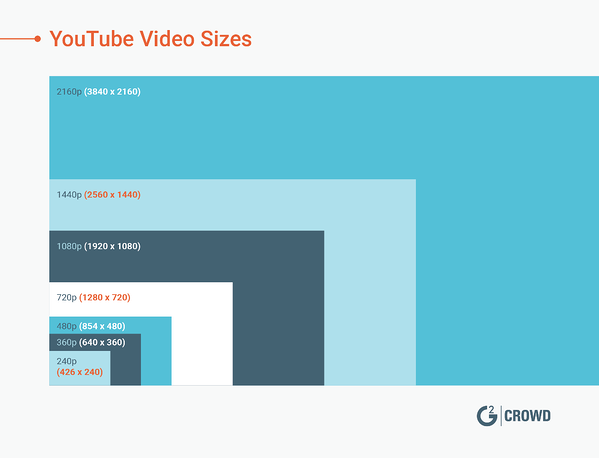 When it comes to YouTube, you need more than the right size for your video. All of your channel art has to have the correct dimensions. 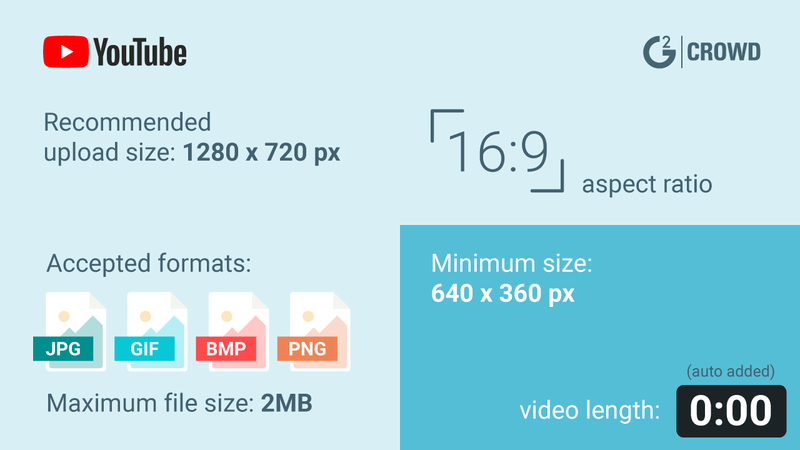 Here’s a basic checklist of all the image sizes for YouTube. Underneath each dimension, you’ll find a link taking you to tips, templates, examples, and instructions for each type of YouTube image. Your cover photo, or YouTube banner, is the channel art at the top of your page. The YouTube banner dimensions are 2560 x 1440 pixels, but the dimensions pictured will vary based on the device the viewer is using. 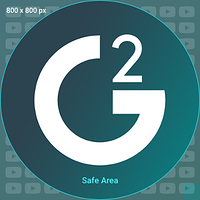 The safe zone, shown in the image above, is the area will be visible on any device. Learn more about your channel art (and how those dimensions look on each device) with tips and templates on the perfect YouTube banner size for 2019. Your profile picture is also known as the YouTube channel icon. Businesses often use a logo, while individuals tend to use a photo of themselves. Get free templates, tips, and 35 examples in this article on the best YouTube profile picture size for 2019. If you want your video to get views, you’ve got to have a great thumbnail. This is the image that will represent your video on all YouTube search results. 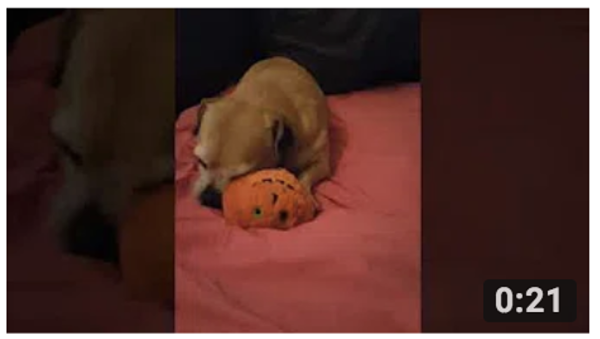 Just like your YouTube video itself, the thumbnail has a 16:9 aspect ratio. Get free tips, examples, and five free customizable YouTube templates with the perfect YouTube thumbnail size for 2019.